The purpose of the Sudler Trophy is to identify and recognize collegiate marching bands of particular excellence that have made outstanding contributions to the American way of life. The Sudler Trophy will be awarded biannually to a college or university marching band which has demonstrated the highest of musical standards and innovative marching routines and ideas, and which has made important contributions to the advancement of the performance standards of college marching bands over a number of years. The Sudler Trophy is made possible by a grant from Louis and Virginia Sudler of Chicago, Illinois. The annual presentation is administered and implemented by the John Philip Sousa Foundation. 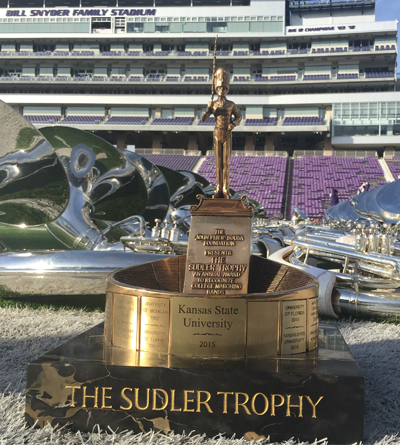 The Sudler Trophy is one in a series of awards developed by Mr. And Mrs. Sudler and the Sousa Foundation to recognize and to encourage excellence in the various aspects of band work. The marching band is a force which reaches countless students and audiences throughout the nation, and the purpose of the Sudler Trophy is to recognize the outstanding work and contribution of college and university marching band directors. The trophy has been designed by the distinguished artist Ed Blackwell. It has been executed by Dieges and Clust, who also produce the Heisman Trophy. Consisting of a bronze drum major astride a football stadium and mounted on a marble base, the trophy stands 22 ½ inches high. Failure to follow guidelines will result in elimination from consideration. E-mails distributed from chair to both Sudler committee membership and marching band directors throughout the nation calling for 2019 Sudler Trophy recommendations. Deadline to submit recommendations to committee chair. Any committee member or band director may submit up to three bands for consideration. These recommendation materials should be submitted electronically to Frank Tracz at ftracz@ksu.edu. For each group that is recommended, a performance DVD (one copy) is required (it should be acquired from the current university marching band director). Each performance DVD should be mailed to the below address and must be postmarked no later than October 1, 2018. All received materials adhering to the submission guidelines will be submitted to the selection screening committee appointed at the 2017 committee meeting in Chicago. Each member of the screening committee will review the materials submitted and forward to the chair through e-mail their top three recommendations (in order of preference). Recommendations are due from screening committee to chair. Chair will tabulate results and determine three nominees for full committee consideration. Supporting material CD is due to committee chair from the three nominees. The formal presentation of the Sudler Trophy will take place at a time and site mutually agreeable to the recipient and to the Sousa Foundation. The recipient will be presented with the traveling trophy, which may be displayed at the recipient’s school during the following year. The school will receive for permanent possession a large plaque, on which will be engraved the names of the university along with current and former marching band directors. The current and all former marching band directors will receive personal plaques, and will be invited to participate in the presentation ceremonies. Each member of the band will receive a personalized certificate. All publicity distributed by the Sousa Foundation will stress that the award has been given for long time contributions of that school and its directors. This is in keeping with the purpose of the award, which is to publicly recognize outstanding achievements by a collegiate marching band over a period of years. This is NOT a contest to select the BEST college band in any given year. Louis and Virginia Sudler were long-time supporters of the Sousa Foundation through their tireless efforts and their generous contributions. The many projects that bear their names have been endowed in perpetuity by the Sudlers. Louis Sudler was the rare combination of successful businessman, a performing artist, and a patron of the arts. He was the founder of the Chicago real estate firm, Sudler and Company. He appeared nationally as a soloist in concert, oratorios, with symphony orchestras and concert bands, at functions honoring five U.S. presidents, and as a recording artist; a baritone, he was a member of the Chicago Civic Opera. Primarily known for his work with the Chicago Symphony Orchestra, where he was chairman emeritus of The Orchestral Association, he had also demonstrated an active interest in bands and band music.